Brief biography: b. 1977, Hong Kong. Lives and works in London. Suki Chan is a moving image and installation artist. Her practice combines light, image and sound to explore our physical and psychological experience of time and space. Using meticulously crafted processes and by abstracting familiar materials and objects, Chan creates uncanny narratives that probe the boundaries between private and public space. 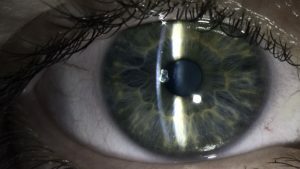 Weaving together images of interior architectural spaces, bio-medical research, and individual testimonies about the experience of perception, Chan’s video project Lucida, exposes the curious and complex relationship between the human eye, the brain, and vision. The project takes its name from the ‘camera lucida’, a 19th century optical device used as a drawing aid. Finding parallels between the camera and the way in which images are projected onto the retina of the eye, Chan has created an artwork that attempts to convey how the outside world is processed by the brain. Lucida seeks to make the viewer distinctly aware of the perceptual processes of seeing by bringing those process – including the flaws, imperfections and assumptions – to the forefront. In Lucida viewers are invited to use eye-tracking technology to reveal their own rapid eye movements – something we are normally unaware of. The multi-screen installation reveals how visual information is modified and processed by the eye and the brain in real time. Lucida is a visceral, visual journey in which Chan’s camera is constantly on the move, restlessly travelling through spaces that lead us, like a thread through a maze, into the heart of her subject. Partially filmed in the University of London’s Senate House, the fluid tracking shots through library spaces and boiler rooms suggest a visual analogy for the interior structures of our eyes and brains. “The commission (Lucida) enabled me to explore a new direction in my practice: how Science can inspire us to look again at the world around us and question if what we see is actually what is before our eyes. My team of collaborators and I learned at a phenomenal rate – from understanding the mysteries of vision itself to the technical breakthroughs required to create an interactive artwork with real time eye movements.” Suki Chan. Lucida had a phenomenological impact. Suki Chan demonstrates how an art-based project with a scientific underpinning can culminate in a visceral and exciting work. Teresa Grimes, Director, Tintype, London. Lucida premiered at Tintype Gallery (Sept 2016) and then exhibited at the Centre for Chinese Contemporary Art (CFCCA), Manchester in January 2017. Chan made a new edit of the work especially for PRESENCE: A Window into Chinese Contemporary Art (9 February – 3 June 2018); due to exhibition space it was not possible to show the full installation. Artist Suki Chan in front of her work Lucida. Installation photograph from PRESENCE exhibition, by Pete Carr. Chan studied at Goldsmiths College and Chelsea School of Arts. She is a visiting lecturer at the Royal College of Art. Upcoming and recent exhibitions include London Nights, Museum of London, UK (11 May – 11 November 2018); Lucida III, SEEING, Oregon Museum of Science & Industry, Portland, US (November 2017 – February 2018); Lucida, CFCCA, Manchester, UK (2017); Lucida, Asia House, London, UK (2017). Lucida, Tintype, London, UK (2016); Lucida III, SEEING, Science Gallery, Dublin, Ireland (2016), Videotage at Art Basel Hong Kong (2016): Lucida II & III Asia House London (2015); A Light Shines in Darkness, FVU touring project: Still Point in St Catherine’s Chapel, Norwich Cathedral & St Werburgh’s Church, Derby, UK (2015). 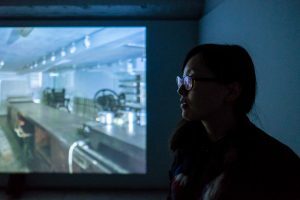 Lucida was commissioned by the University of Salford with the Centre for Chinese Contemporary Art (CFCCA) in partnership with the Centre for the Study of the Sense, University of London and Tintype. Supported by the Wellcome Trust Small Arts Award and Arts Council England.